Actor wins award for Breakthrough Performance in writer/director Andrew Ahn's feature debut. Over the weekend, the 2016 Sundance Film Festival wrapped up ten days of premieres and deals by handing out awards for the festival's top films. Huge congratulations go to actor Joe Seo, who won the U.S. 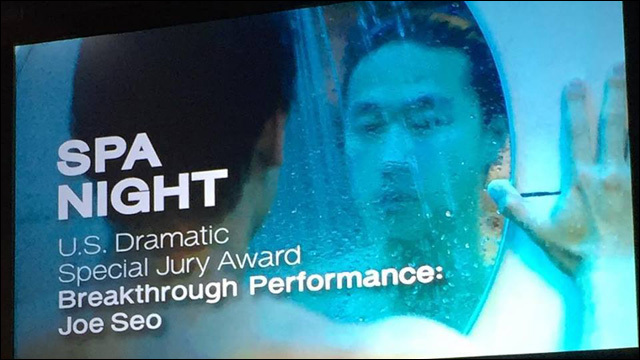 Dramatic Special Jury Award for Breakthrough Performance in Spa Night. Seo plays 18-year-old David Cho, the closeted son of immigrants parents living and working in Los Angeles' Koreatown. As his parents struggle to make ends meet, David grapples with his awakening independence, sexuality and Korean American identity in writer/director Andrew Ahn's quiet, confident feature film debut. Spa Night is a remarkable, moving film that simmers with thoughtful honesty and Andrew's uncompromising, assured direction. And of course, a really wonderful starring -- and now, award-winning -- performance from Joe Seo, as well as Haerry Kim and Youn Ho Cho, who play his parents. I haven't seen a Korean American story told quite like this before. The accolade is well-deserved. Hopefully, audiences beyond Sundance will be able to see the film soon. For further information about Spa Night, follow updates on Facebook and Twitter.